Let me introduce you to a pair of boyfriend jeans that I finally like. I have loads of skinny jeans but it wasn't easy to find boyfriend ones that fit me the way I wanted. I found them at Zara (trf), and I decided to wear them with studded stiletto pumps and a striped top, trend for Spring/Summer 2013, for a casual chic look. Lasciate che vi presenti un paio di boyfriend jeans che finalmente mi piacciono ! Ho tanti jeans modello skinny ma non è stato altrettanto facile trovare un paio modello boyfriend che facesse al caso mio. Li ho trovati da Zara (trf) e ho deciso di indossarli con un paio di pumps con il tacco a spillo ed un top a righe, molto trendy per la stagione Primavera/Estate 2013, per un look casual chic. In the pic above you can see details of the studded pumps you had already seen with a dress. The long black vest is another purchase from Zara. 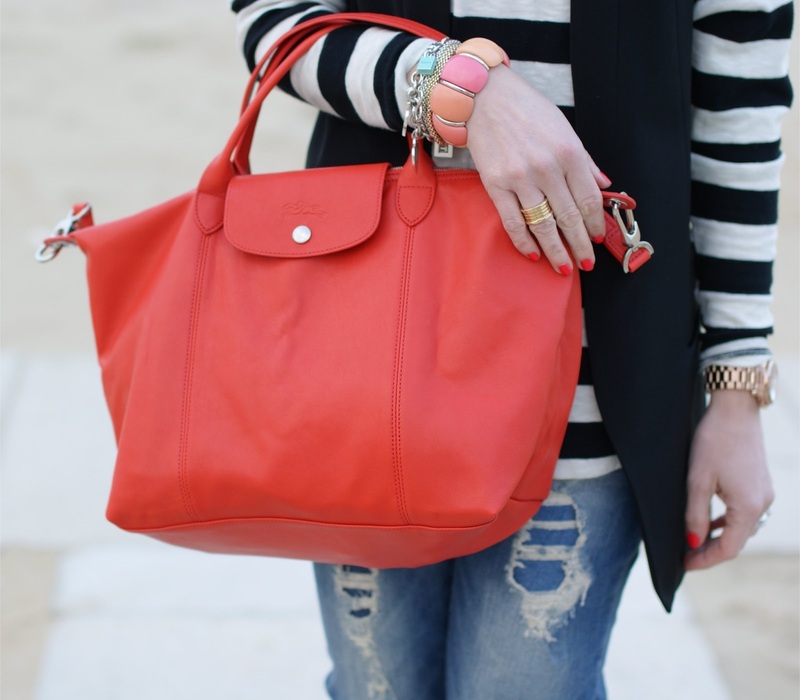 The only pops of color in this outfit are the bag and the nail polish, same color as my Longchamp ;). Nella foto sopra potete vedere le pumps borchiate in dettaglio, le avevo già mostrate indossate con un vestito. Il lungo gilet nero è un altro acquisto fatto da Zara. Gli unici tocchi di colore in questo outfit sono la borsa e lo smalto, dello stesso colore della mia Longchamp ;). Even my woolen coat was in black-grey tones, you can see it in the following pics. I love it so much and I like to wear it with dresses as well as with jeans. Sincerely, I really love mixing elegant clothes with casual ones, I think the outfits featuring a mix of styles are also the most interesting ones, what do you think ?. Today I am very glad because I am going to have a couple of days off from work starting tomorrow, for Easter holidays, yay ! The weather is gonna be bad...rainy and kind of cold, but it doesn't matter...I am going to bring my Hunter boots with me, this is sure !. Anche il mio cappottino in lana era nei toni del nero e del grigio, come potete vedere dalle foto seguenti. Mi piace molto indossarlo sia con abitini più eleganti sia con i jeans. A dire il vero, una delle cose che preferisco è mixare capi più classici ed eleganti con capi più casual, trovo che quelli realizzati con un mix di generi siano i look più riusciti, voi che ne pensate ?. Oggi sono felice perché da domani sarò in ferie per qualche giorno in occasione della Pasqua, evviva ! Il meteo prevede pioggia e temperature non certo primaverili, ma va bene lo stesso...di sicuro, porterò con me gli Hunter boots !. Shopping tip: Romwe Easter Day Sale ! From 27/03/2013 to 29/03/2013 - Stay focus on www.romwe.com ! One day left to enter this amazing giveaway ! Fashion and Cookies teamed up with In Pirate We Trust to offer you a great giveaway, up until March 28th ! Two lucky followers of this blog will win a $ 25 gift card each to get whatever they want on InPirateWeTrust.com, the giveaway is open worldwide and to read the rules and enter you can click here !, so what are you waiting for ? Do NOT miss the chance to get some cool new accessories and good luck ;) !. -----> Important notice: Google Reader will be closing down since July 1st, so it's better to import all the blogs you were following in Google Reader in your Bloglovin account ASAP. To do it, log into Bloglovin and click here ! -------->Notizia importante: Google Reader sarà chiuso definitivamente il giorno 1 Luglio, è meglio pertanto importare tutti i blog che stavamo seguendo già con Google nel nostro account Bloglovin al più presto. Per farlo, fate log in in Bloglovin e cliccate quì !. What an amazing! Vest! I need it in white!! Long Champ bags are very cool. They make great everyday bags. Love the color you chose. Very bright. I haven't been visiting them in a while. hi sweetie.. awww lovely bag! Molto bella la borsa!!! E anche le scarpe!!! Cosa posso dire se non che stai benissimo e il tuo look mi piace davvero tanto? Tutto bello, colore della borsa perfetto, boy friend jeans favolosi e cappottino mozzafiato! wow- such a pretty look. i totally love it. Jeans is perfect!!! I am surching the same ones for me! This is a stunning look! I love the top and the bag. Delizioso l'intero outfit!Sono una nuova follower! ;) Ti aspetto da me se ti va..
Amazing outfit. I have a similar Red longchamp Bag which I got recently and love it so much! I love the outfit. It all works perfectly together and I love the color of the bag. Nice boyfriend outfit dear! Looks really casual. Di questo outfit, molto chic, mi piace praticamente tutto. La borsa è favolosa e mi piace molto in questo colore. stai benissimo è tutto perfetto, molto attuale, ma personale!e la borsa nuova:promossa!! Bellissimo questo tuo look! Mi piace molto! Love the contrast of red against the black and white stripes. Grazie per aver visitato il mio blog. Ti faccio i complimenti per il tuo davvero bello e interessante. That bag looks perfect-classic, yet with a bit of spice to it! :) And I love that you paired it with stripes! Abbiamo gli stessi jeans!! Non avevo mai pensato ad una borsa longcham e ho fatto male, mi piace questa qui...troppo!! Thanks so much for stopping by! Love your blog and your outfit!! Just followed you on GFC and Bloglovin' as well! 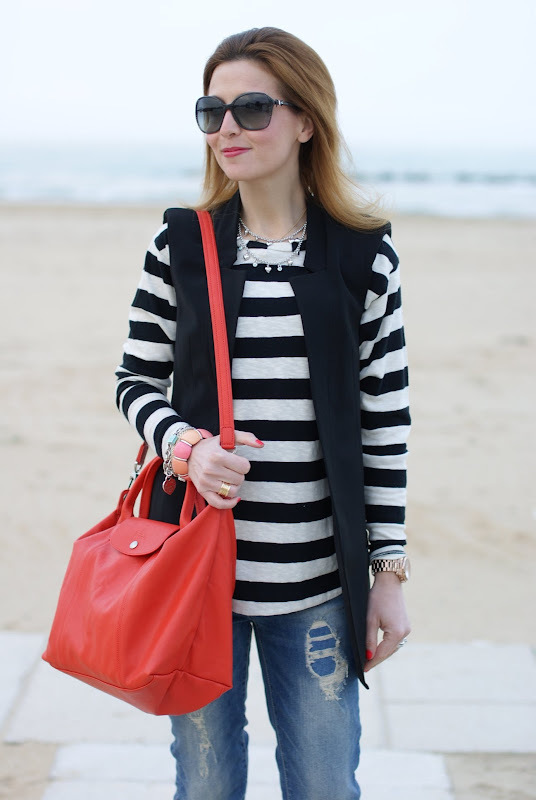 totally digging the take on nautical chic!! 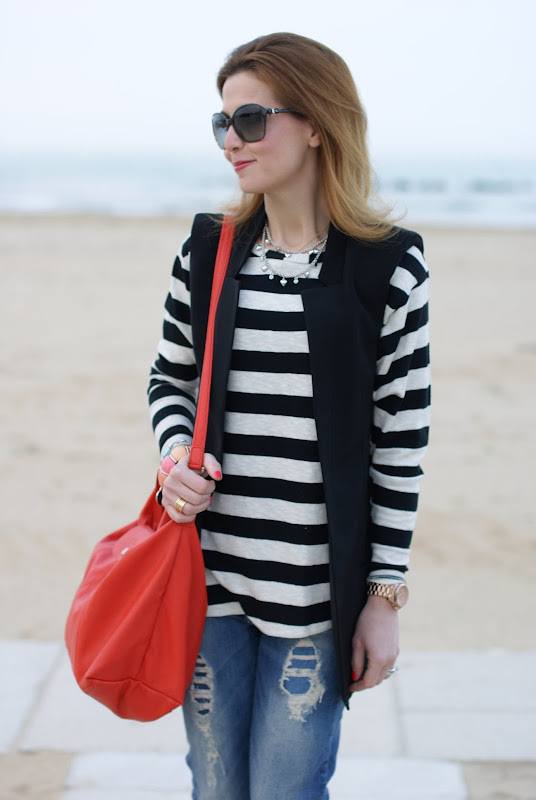 Love the bold stripes and red bag! Stai benissimo, che bello il cappotto! Questo outfit mi piace molto, perché adoro il tocco di colore vivace ed esplosivo dato dalla borsa. E trovo ti stia benissimo l' abbinamento maglia+gilet lungo, (ma quanto li adoro peccato a me stiano male! )+boy jeans. Bellissime le pumps ed hai fatto benissimo ad indossarle con calza coprente. Thanks for the comment, do you want the blog, do you want to follow us? Bella la borsa. Mi piace come il suo tocco di rosso spezza l'intero outfit! bellissima!! issima! i boyfriend strappati ti stanno super bene! Great look. All is awesome, I like your style! Your bag is beautiful and I love your Chanel sunnies too! I love your coat so much! That is really lovely! Oooh I love your handbag! Happy Easter for you, dear! Posso dirti che mi piace tutto?!! ?Si si posso perchè è la verità! La Longchamp rouge è meravigliosa, bella scelta! mi piace molto questo jeans!!!! In effetti e' molto bella e poi sono rimasta colpita dalle tue scarpe, favolose! Ps. Sono donkuri con nuovo nome e nuova grafica :) buona giornata! Bellissimo il tuo look e adorabile il tocco di colore della tua nuova borsa!! Cara Vale, dovrei fare una wish-list extra in cui includere le tue borse super!! Sei molto chic come sempre! What a beautiful bag & the red is such a nice pop of colour against the black & white! You look great as always!! Love the red longchamp bag!! Molto bella la borsa: hai fatto un'ottima scelta! Mi hai persino fatto rivalutare le righe con questo outfit!